Last month, The Prince of Wales launched the Royal Parks charity in Hyde Park, following the merger of the Royal Parks Agency and the Royal Parks Foundation. His Royal Highness toured the under-construction ‘super’ nursery, which will house the 500,000 flowers and shrubs that are needed for all eight Royal Parks – reducing lorry movements and the need to buy in plants. The Prince then met school children in the wildflower meadow area who were engaged in insect meadow sweeping, and tried to catch some of the bugs for himself. His Royal Highness was also shown a story telling educational ‘snail’ from Mission: Invertebrate, whose mission is to educate people about the role invertebrates have to play on the environment. After enjoying a trip in a horse-drawn carriage, The Prince arrived at the Ranger’s Lodge to launch the new charity, of which His Royal Highness is the new patron. 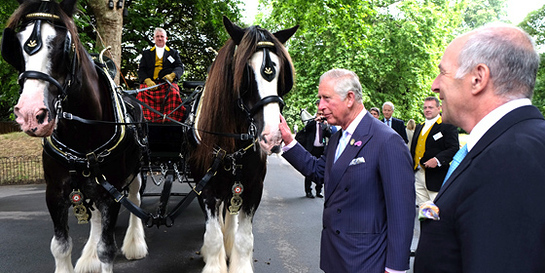 The Shire horses (named Aragon and Royale II) are part of Operation: Centaur. They are working horses in urban communities who have worked in the parks since 2012. The animals are also used as therapy horses, working with young people with autism in Richmond Park, and have helped to deliver anti-bullying programmes in Hyde Park. During the reception, Loyd Grossman presented His Royal Highness as the new patron of the Royal Parks charity, before The Prince unveiled a plaque. The Prince was then presented with pots of honey as a gift, which was made from produce from the Royal Parks.